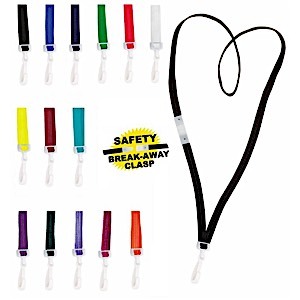 Break-Away Neck Cord has safety cord that releases when tugged. The clasp reattaches with a snap and is designed for thousands of releases. Plastic J hook attachment. Also available imprinted with your message, call for details. Available Colors: Black, Royal Blue, Navy Blue, Green, Red, White, Yellow, Maroon, Teal, Orange. Purple, Dark Green, Violet & Raspberry.